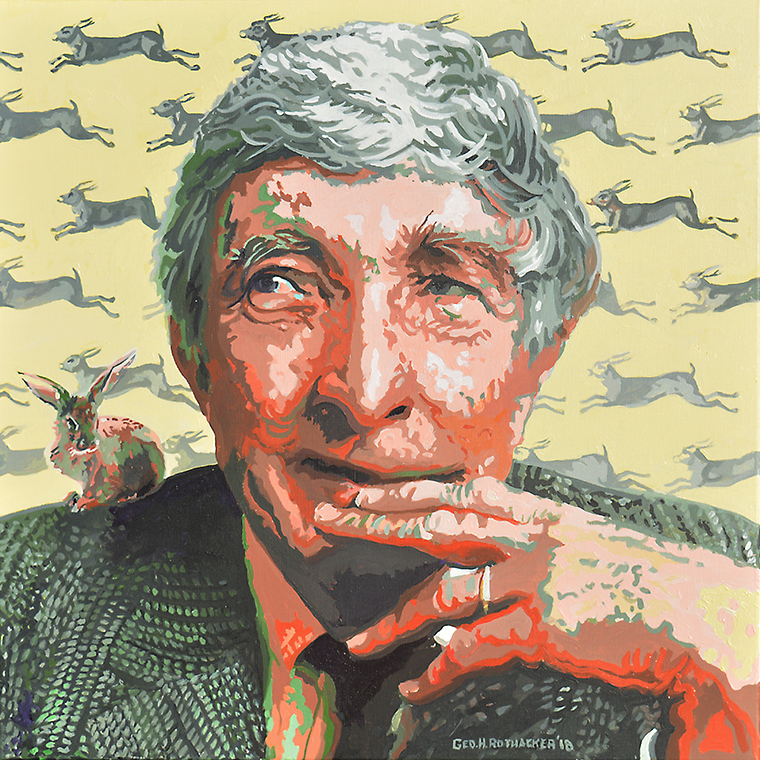 John Updike by George H. Rothacker - acrylic on canvas - 24" x 24" - Original painting $2400, prints @$90 each plus tax and shipping (Prints are an edition of 50, signed, titled and numbered with an image area of 13"x 13"). 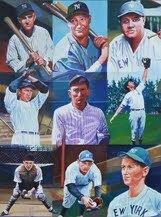 John Hoyer Updike was an American novelist, poet, short story writer, art critic, and literary critic. One of only three writers to win the Pulitzer Prize for Fiction more than once. Updike published more than twenty novels, more than a dozen short-story collections, as well as poetry, art and literary criticism and children's books during his career. Hundreds of his stories, reviews, and poems appeared in The New Yorker starting in 1954. He also wrote regularly for The New York Review of Books. His most famous work is his "Rabbit" series (the novels Rabbit, Run; Rabbit Redux; Rabbit Is Rich; Rabbit at Rest; and the novella Rabbit Remembered), which chronicles the life of the middle-class everyman Harry "Rabbit" Angstrom over the course of several decades, from young adulthood to death. Both Rabbit Is Rich (1982) and Rabbit at Rest (1990) were recognized with the Pulitzer Prize. 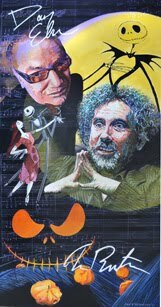 I came upon his writing in the 1970s, and was not enthralled with his signature novel "Rabbit Run," about a middle American lino type machine operator. I in fact dropped the book on my first reading, and then again on subsequent read after loving all of his subsequent “rabbit” novels. I particularly loved his use of language and his realization of himself as an imperfect human being who didn’t and couldn’t live up to his own standards of behavior. His fiction is distinguished by its attention to the concerns, passions, and suffering of average Americans, its emphasis on Christian theology, and its preoccupation with sexuality and sensual detail. His work has attracted significant critical attention and praise, and he is widely considered one of the great American writers of his time.